310. 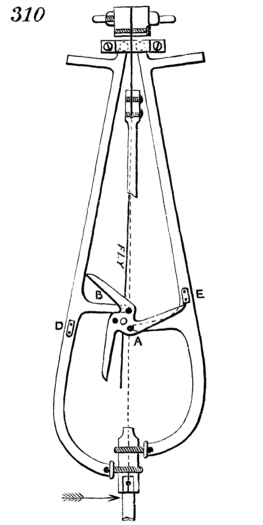 Three-legged gravity escapement. The lifting of the pallets, A and B, is done by the three pins near the center of the escape-wheel, the pallets vibrating from two centers near the point of suspension of the pendulum. The escape-wheel is locked by means of stops, D and E, on the pallets.